All of our products utilize Composition Myography (CM), a scientific measurement technology invented and further developed by our company founders. "Myography" literally means "the description of muscles." Let’s start with the basic outline of a very simple CM device (see figure). In this basic version, there are only 4 electrodes (unlike the Skulpt Scanner, which has 12). When applied to the skin, a very weak current passes between the outer two electrodes. This current is high-frequency and alternating in nature. As the current moves through the skin, the subcutaneous fat, and the muscle, it loses a little bit of energy due to the resistance of the tissue. This change is then measured by the two inner electrodes. In addition, the muscle fibers briefly store and release the electrical charge. This confers a short time delay on the measured voltage on the inner electrodes. Thus, CM measures two separate features of the tissue: its resistive properties and its capacitive properties. The Skulpt Scanner is more complex, in that it measures electrical current flow in different directions. It can also measure the flow at different depths (the further apart the electrodes, the deeper the electrical current will penetrate). By combining these multiple electrode configurations with multi-frequency electrical measurements, and using a variety of algorithms, the Skulpt Scanner and App can separate out the condition of the muscle from the amount of fat in a region in just a matter of seconds. How Does EIM Compare to Bioimpedance? What is Muscle Quality & How Does it Compare to Steak?! There are two other important features of CM. The first is that the electrical current can be applied at a range of frequencies. Different tissues (muscle, fat, bone, etc) are sensitive to the frequencies in unique ways. In other words, some tissues have a great effect on the electrical current at one frequency but not at another. This is an important feature since it allows us to separate effects of fat from those of muscle. The second feature is that electrical current flows more easily along the muscle fibers than across them. This feature also allows us to discriminate muscle from other tissues, since fat, skin, and bone do not have this unique characteristic, called anisotropy. 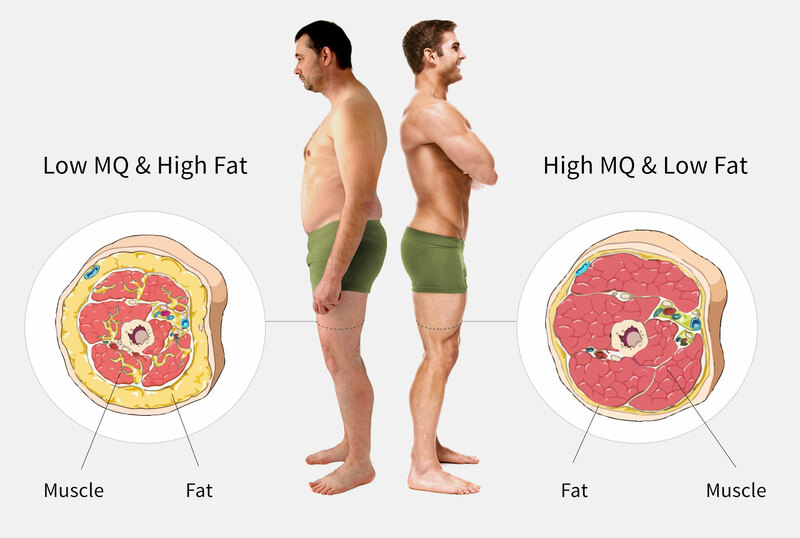 So how do we get you those two values: the percentage of fat over a specific region, and the Muscle Quality (MQ)? The more fat underlying the skin and within the muscle, the greater the resistance. Thus, we are able to get a measure of the amount of fat by evaluating the resistance. For MQ, we rely to large degree on preferential directions of current flow, and effects on time delay between the applied current and the measured voltage. In muscle tissue, bigger fibers have greater strength. They also demonstrate greater electrical charge storage capacity and greater time delays. The Skulpt Scanner and App use these and other indicators to provide a highly accurate assessment of MQ in each location. Alterations in the muscle condition can also affect the electrical impedance of the muscle. For example, muscle injury will produce edema in the muscle, which will alter its electrical conduction. Thus, CM can be sensitive to muscle overuse and also disease, the original use for which it was created. Most people compensate for relative weak spots unconsciously, all the time. Experts can see it in our posture, the way we walk, and even in the bad form we resort to when doing certain strength-training exercises. But hey, those compensations get the weights overhead and our arms locked out. They also make it hard to determine the quality of any particular muscle by simply tracking workout data. By measuring MQ directly, in multiple locations, CM offers more accurate information about individual muscles, and overall fitness, than activity trackers or complex, detailed workout logs can hope. CM technology was initially developed to measure the muscle health of patients with neuromuscular disorders, such as ALS. Through 16 years of development and research, and in the years after the technology was successfully adopted for medical use, we have also learned a lot about using CM for evaluating minor differences in healthy tissue. The company then introduced the Scanner, and we continue to add to our knowledge base and capability set.